Summary and Definition: The Sauk tribe, also known as the Sacs or Saukies were a fierce, warlike people who originally inhabited territory in the western Great Lakes region then moved west of Lake Michigan to present-day Wisconsin. In 1734, the Sauk joined in a alliance with the Fox tribe who had been defeated by the French in the Fox Wars. The tribes extended their territory westward beyond the Mississippi. 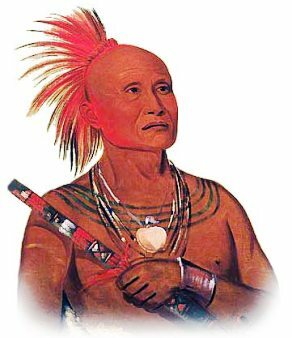 Sauk chiefs included Keokuk, Wapello and the famous Black Hawk, leader of the 1832 Black Hawk War. The above picture depicts Pam-a-ho, meaning the Swimmer, who was one of Chief Black Hawk's Warriors. It was painted by the famous artist George Catlin (1796-1872) at Jefferson Barracks in 1832 where Black Hawk and his warriors were imprisoned following the Black Hawk War, the last of the Indian wars that took place in the Old Northwest Territory. Pam-a-ho's hair is shaved leaving a scalp lock to which a roach headdress was attached. The roach headdress stood straight up from his head like a crest and held open by comb-like object called a roach-spreader. The roach headdress was dyed red, the same color as his body paint. Black Hawk and his fellow captives such as Pam-a-ho and were presented to different nations in the United States and in Europe. What language did the Sauk tribe speak? The Fox tribe spoke in a related dialect of the Algonquian language. The name 'Sauk' derives from the Algonquian word, 'Osakiwug' meaning the "Yellow Earth People", in reference to their creation myth. What was the lifestyle and culture of the Sauk tribe? The Sauk (Sac) tribe were farmers, hunter-gatherers and fishermen who made good use of their lightweight birchbark canoes they used on hunting, trading and fishing trips. Originally living along the western Great Lakes, they extended their lands into Wisconsin and the biggest Sauk villages were on the Wisconsin River. They extended their territories further west where they hunted buffalo. Their neighbours were the Fox tribe who were defeated by the French during the Fox Wars (1712 - 1733). The Fox then joined the larger Sauk tribe, an association that led to a long standing alliance. Both the Sauk and the Fox (Meskwaki) people had a strong sense of tribal identity and each tribe retained their separate chiefs, customs and traditions. The Sauk maintained good relations with the French until the Fox Wars and also traded with the Dutch and the English. The Sauk left their central Michigan location for northern Wisconsin after tribes of the Iroquois Confederacy attacked the people in the mid-seventeenth century. The Sauk became allies with the British during the French and Indian wars (1689 - 1763). The Fox tribe relocated south from Wisconsin into Iowa, Illinois, and Missouri. Following the American War of Independence an alliance of many different tribes, called the Western Confederacy, was formed who aimed to keep the Ohio River as a boundary between Native Indian lands and the United States. The Sauk subsequently fought in Little Turtle抯 War (1785�95), Tecumseh's War (1811�13) and the 1832 Black Hawk War. The Indian Removal Act of 1830 resulted in the Sauk tribe being moved to reservations in Indian territory. This article contains fast, fun facts and interesting information about the Sauk Native American Indian tribe. Find answers to questions like where did the Sauk tribe live, what clothes did they wear and what food did they eat? Discover what happened to the Sauk tribe with facts about their wars and history with the Sauk History Timeline. Where did the Sauk tribe live? The Sauk are people of the Northeast Woodland Native American cultural group. The geography of the region in which they lived dictated the lifestyle and culture of the Sauk tribe. What clothes did the Sauk tribe wear? The picture of the Sauk brave like all warriors, wore war paint to intimidate his enemies. He wears a necklace of bear claws and another of beads and shells. 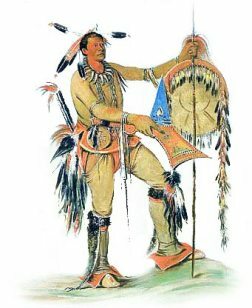 His buckskin clothing is decorated with his battle trophies in the form of small scalp locks taken from his enemies - refer to practise of Taking Scalps in Indian Warfare. His breech cloth is passed between his legs and attached to a cordage belt. Also attached to his belt is soft pouch made from deerskin. He wears buckskin leggings and moccasins. His elaborate shield would have been used during horseback warfare and he carries a gunstock club that would have been used in hand-to-hand combat. What did the Sauk tribe live in? The Sauk tribe lived in two different shelters, the permanent longhouse structure and the wigwam, a temporary shelter that was used by Algonquian speaking Native Indian tribes who lived in the woodland regions. The Sauk longhouses were built from birch bark and surrounded by their crops and often a lacrosse playing field. The dark, windowless Longhouses had a rounded roof with doors at both ends of the longhouse and a smoke hole in the roof to let in air and light. The Sauk wigwams were small oval or cone-shaped shelters with an arched roof made of wooden frames that were covered with woven mats and sheets of birchbark, held in place by ropes or strips of wood. Some Sauk wigwams were covered with buffalo hides, if this was a major resource in the area they lived in. A Sauk wigwam was usually about 8-10 feet tall and 10 - 15 feet wide at the base. The Sauk played stickball, the forerunner of lacrosse or racquette. The picture by George Catlin depicts stickball players. 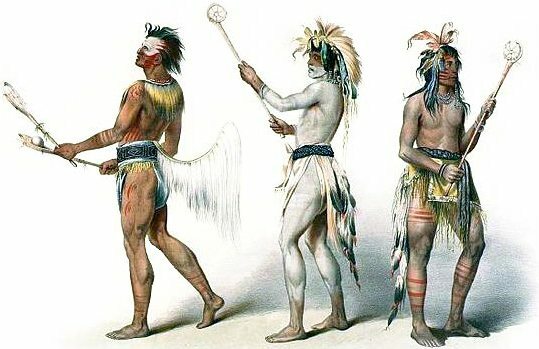 The Sauk maintained numerous clans and the young men were divided into two major ceremonial groups called "moieties" that ensured an equal division of the tribe during games like lacrosse. Members of the Kishko (Long Hairs) moiety painted themselves white. Whilst members of the Oskush (Brave) moiety painted themselves black. In this stickball or lacrosse game the ball was caught with a netted ball-stick. As many as 100 - 1,000 men from opposing teams, villages or different tribes would participate in these games. What weapons did the Sauk use? The weapons used by the Sauk warriors included bows and arrows, spears, lances, war clubs, gunstock clubs, tomahawks and knives. The Native Indian enemies of the Sauk included the Iroquois, Illinois, Osage and the Sioux. What food did the Sauk tribe eat? The food that the Sauk tribe ate depended on the natural resources that were available to them in the locations that they lived in. Sauk History: What happened to the Sauk tribe? The following Sauk history timeline details facts, dates and famous landmarks of the people. The Sauk timeline explains what happened to the people of their tribe. 1667: The first Sauk contact with the French at Chequamegon Bay, Lake Superior. Jesuit missionary Claude Jean Allouez, vicar general of Quebec, was the first person to describe the Sauk and wrote that the tribe was more savage than all the other peoples he had met. 1812: Black Hawk and the Sauk side with the British in the War of 1812. 1887: The Dawes General Allotment Act led to the break up of the large Indian Reservations and the sale of Native Indian lands to white settlers.